The psychology may seem slight but the subversion of the typical revenge scenario and the irony of the ending, when the Scott character is hailed as a town-tamer but is clearly a spiritually-ruined man, make this one of my favorite Boetticher westerns. Yes, Boetticher did, very slyly and gleefully, subverted genre conventions & in turn audience expectations. The "protagonist" was far more beyond redemption than the "antagonist". 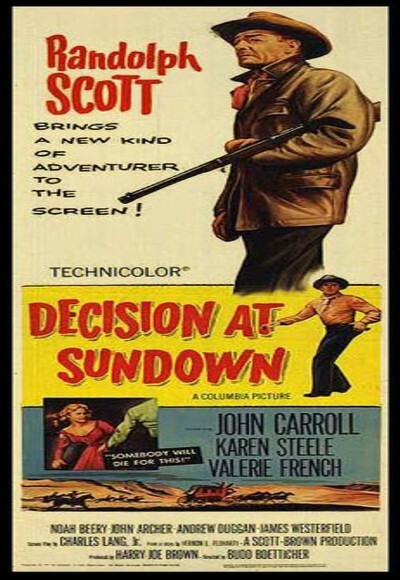 Though I wouldn't consider among my favourites, Samuel, this indeed remains an interesting Western. By the way, I'd be keen to know which are your 2 or 3 favourite Boetticher Westerns (preferably in order of preference). This happened to be my first tryst with his films, so willing to explore more. It's not one of my favorite Boettichers, but I can't argue Samuel or anyone else that feels otherwise. I think your own solid but guarded review and sentiments Shubhajit are closer to my own. It's no NAKED SPUR. Thanks Sam. Yes, it sure had its moments & qualities, even if it felt tad slight in the end. Need to watch more of Boettichers though.